Migration Date is Confirmed for DiGi's Gateway with Double Opt-In features! Recently, DiGi has recalled to continue the previous pending migration for our short code connection to DiGi. After some email confirmation with our dedicated engineer, we have finally confirmed on the migration date for this CPA Service Subscription and Double Confirmation (which is a new MCMC requirements) features! Our migration date has been confirmed on this coming 21th November 2012 , 12.00 am! The affected short code included 32886, 33886, 36886, 39886, 378886, and 33881. Hence, please be advised that do not conduct any SMS campaign for both Premium and Bulk SMS over our DiGi connectivity during this period of time! Our Business Manager will keep all our merchants updated for this migration once done. 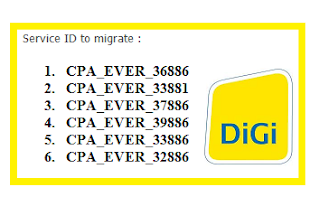 Basically, as per our understanding with DiGi, this is only the pre-migration requested by DiGi, and it doesn't mean EVERWORKS's short codes are immediately compliance to this requirement once migration is done. But this is like to GET READY for us, and DiGi can 'Turn-On' this feature anytime they want once the migration is done! According to conversant email history, we have started the discussion with DiGi over this migration since February 29, 2012 (which as already 8 months ago).